A black and white negative of St. James Anglican Church and cemetery located on Lot 2, Concession 4, Brock Township. View is of the cemetery and the back of the Church. St. James Anglican cemetery was established in 1864 on Lot 2, Concession 4, Brock Township. The church was built circa 1865. This photograph was taken at the reopening service of the church on Sunday September 18. No year was specified on the negative envelope. 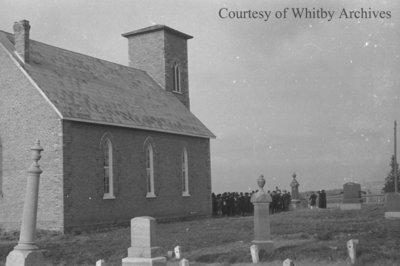 St. James Anglican Church and Cemetery, c.1939, Marjorie Ruddy. Whitby Archives A2013_040_690D.